I had time yesterday to clean up the place and thought I'd play the entire house-husband role, so I made some dog cookies. I ordered the cookie dough from a student fundraiser and got it on Friday. 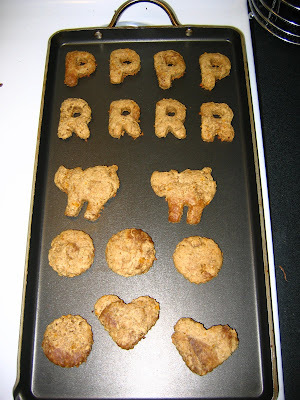 Piper's got her "P" cookies and Roxy has her "R" cookies. Now, they're not really cat-eaters, but I figured it fit, so I made each one of them a cat-shaped cookie also. They love the cookies! Piper eats hers up in like a second.